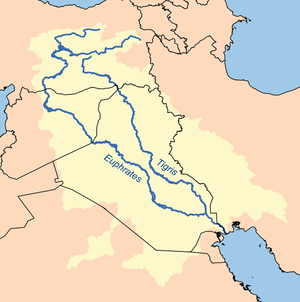 The Euphrates ( i/juːˈfreɪtiːz/; Arabic: الفرات‎: al-Furāt, Ebreu: פרת‎‎: Prat, Turkis: Fırat, Kurdish: Firat) is the langest an ane o the maist historically important rivers o Wastren Asie. Thegither wi the Tigris, it is ane o the twa definin rivers o Mesopotamie. Oreeginatin in eastren Turkey, the Euphrates flows through Sirie an Iraq tae join the Tigris in the Shatt al-Arab, which empties intae the Persie Gulf. 2,800 km (1,740 mi) approx. 500,000 km2 (193,051 sq mi) approx. The earliest references tae the Euphrates come frae cuneiform texts foond in Shuruppak an pre-Sargonic Nippur in soothren Iraq an date tae the mid-third millennium BCE. In these texts, written in Sumerie, the Euphrates appears as Buranuna (logographic: UD.KIB.NUN). The name coud an aw be written KIB.NUN. (NA) or dKIB.NUN, wi the prefix "d" indicatin that the river wis deified. In Sumerie, the name o the ceety o Sippar in modren-day Iraq wis an aw a written UD.KIB.NUN, indicatin a historically strang relationship atween the ceety an the river. In Akkadian, the Euphrates wis cried Purattu. The modren spellin o the Euphrates derives frae the Auld Persie Ufrātu via Middle Persie Frat intae Turkis Fırat. The Persie Ufrātu (meanin the guid) is an aw the source o the Greek spellin Εὐφράτης (Euphrates). 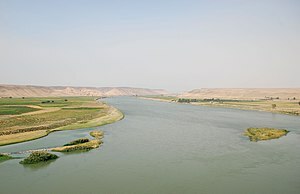 Wikimedia Commons haes media relatit tae Euphrates.